People travelling this Sunday (11 November) are advised to plan ahead as Greater Manchester remembers those who have died in the line of duty. Metrolink services will stop shortly before 11am as the nation observes a two-minute silence to mark Armistice Day and Remembrance Sunday. There will also be a number of minor changes to tram services for the Remembrance Day event taking at St Peter’s Square. 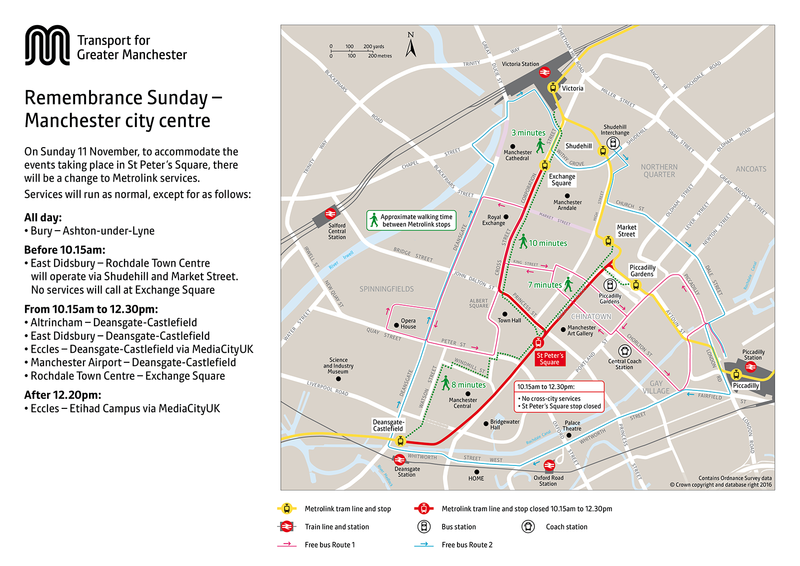 Transport for Greater Manchester (TfGM) has created a special travel advice page containing all the relevant information and a bespoke walking route map to help people get around the city centre. Towns across the region will also be holding their own parade and service, which may result in some localised road closures and bus diversions. Later on in the day, old rivals lock horns again as Manchester City host Manchester United at the Etihad (kick-off 4.30pm). A crowd of 55,000 is expected with roads and public transport likely to be busier than usual. Given the ongoing Manchester and Salford Inner Relief Route work, (MSIRR) motorists are reminded to allow more time for their journeys and consider using public transport where possible. Head of Customer Engagement, Sean Dyball, said: "We want everyone travelling to any of the events taking place on Sunday to get there on time so they don’t miss a minute. "Transport is expected to be much busier than usual, particularly around the city centre, so it's important people allow a little extra time for their journeys. "On the day we will be doing our utmost to help our customers – including monitoring the road network with our 24 hour control centre – and we will look to push out real-time journey information through our social media channels". For information on public transport across Greater Manchester visit www.tfgm.com, call 0161 244 1000 (7am-8pm, Monday to Friday, and 8am-8pm at weekends and bank holidays) or follow @OfficialTfGM on Twitter.